Guest speakers: Peter Dearden and Julia Horsfield. Genetics Otago postgraduate students meet monthly for presentation of their work, discussion of skills, problem solving and development. This past month we had two guest speakers attend to talk about their career paths and to hand down some general advice and knowledge to the aspiring (or undecided) future academics in the audience. Dr Julia Horsfield started off the session with a quick run-down of her path from an Honours degree at Victoria University, Wellington to her current appointment as a senior lecturer at Otago and the Principal Investigator of the Chromosome Structure and Development Group in the Department of Pathology, Dunedin School of Medicine. After her honours degree Julia travelled around the world a bit — not yet convinced that an academic career in science was the path for her. 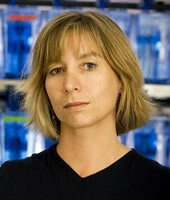 She ended up at Cambridge University with a job involved in the Drosophila mutant identification work being carried out in the late 80’s, and found the environment exciting — she emerged from that job inspired to continue in science — and to remain involved in Developmental Biology (the study of the growth of things — from egg to adult: Dev Bio). Julia considered doing a PhD at Cambridge University, but unable to obtain funding returned to New Zealand to work in a lab for a couple of years. Eventually she got out the Otago University phone book, threw a pin in it and rang the target to enquire about who might be working in Dev Bio. The person who ended up answering the phone was Warren Tate, now Professor in the Department of Biochemistry at Otago, and Julia completed her PhD in his lab, working on HIV. Julia’s first postdoctoral position was in Adelaide, Australia, working with Drosophila again, and in 1999 she returned to NZ to a job at Auckland University (gasp!) to begin work with Zebrafish. She was in Auckland for 8 years — it took 3 years for her to realise she could start her own lab — and then another 5 years to achieve that appointment. It took Julia a while to figure out just what she wanted to do with her life — and that she could do it, she was both capable and stubborn — and eventually ended up exactly where she wanted to be. Whilst in Auckland Julia started her family and understands how hard it can be to achieve that ever mysterious work-life balance; and the extra pressure felt by women, and mothers in research science. Being in Auckland, and with 5 long years stretching before her with reasonably steady income promised — starting a family at that time was a logical choice. Some of her best advice included to be stubborn — constantly network and introduce yourself to everyone so that everyone might know who you are — and that at some point in the future, when you need them to know your name, they will remember you — and hopefully give you that job. It helps to know your community — to be seen at seminars and events, to meet the professors and lecturers at your institution and outside, and to refrain from being shy and retiring. Be the squeaky wheel — get heard and noticed, constantly push your own boundaries and you cannot help but go up. The topic of women in science — and women hoping to juggle both a scientific career and a family, are very much in peoples’ minds at the moment. Julia’s frank advice was to find the perfect husband — support at home when you are balancing both a scientific career and a young family is crucial. As an example of good planning and brilliant timing, Dr Megan Wilson, a postdoc in Peter’s lab, has had two children while thus employed — and her CV shows no break as evidence of it. This is more, perhaps, a credit to her very great family support and amazing ability to write papers whilst still on maternity leave than the equal status attributed to mothers and fathers in research science in NZ. Another point was to have matching ambitions in the relationship, but mostly — know what is important, and don’t lose sight of it. Julia says her kids keep her sane — and that being a mother has made her a better scientist. Though she has perhaps less time to spend on her work than her male colleagues (those who choose not to be both full-time parents and scientists) she says it has made her more efficient, and places a slightly different value on her work — she could not go home to her family and hold her head up high if she had not put 110% effort in to her research. Julia currently runs the Otago Zebrafish facility, is a senior lecturer, mother, supervisor and boss — she has a team of postdocs, research assistants and students all working with her to achieve something great. At this point we digressed in to alternate careers — both Julia and Peter know people who have diverged from science into law; company law — what not to invest in, in biotechnology, patent law, Chief editor of a major scientific journal, Executive at Unilever, Biotechnology companies, Industry and Research Management. The options are certainly there to be investigated. With regards to an academic career — for the last available position in the Department of Zoology, for an example, over 120 people applied. So how do we look amazing? How do we obtain that elusive academic appointment? The most important thing — networking. Ask questions at seminars and journal clubs, put your hand up for things, be seen — make people know you are there. Whilst looking for jobs in New Zealand — Peter applied for the job at the Biochemistry Department and then attended every seminar, every journal club presentation, every gathering – and made sure to have his voice heard.